iSuggestNow introduced by DSS Systems is a tool to promote collaborative sharing of ideas and facilitate corporate governance in the company. 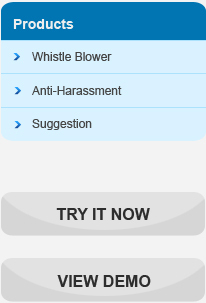 It is a tool that can help employee, partners and customers to speak their mind. DSS Systems & Software Technologies Ltd.
DSS Systems & Software Technologies Ltd. a ISO 9001:2008 certified organization was established in 1976, HO at Pune, India and has more than 1800 person years of software development experience, across 450 software projects spread across continents, covering multiple environments and technologies in various industry segments. DSS has Software development;Software Products; Business Process Management consultancy practice;Advance Production Planning & Scheduling; Microsoft Azure based development; Tally ERP 9 implementation; Oracle E-Business Suite implementation & CRM OD implementation services. DSS is a Tally Integrator partner.